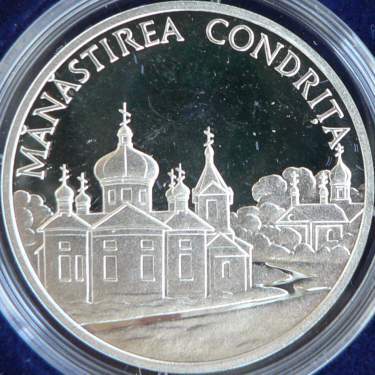 The design of the coin is "generic", not respecting the disposition of the buildings inside the monastery. The church on the left hand side is the "Dormition", while the one on the right is most likely the "Saint Hierarch Nicholas". No angle exists at Condriţa out of which the two churches can be seen like this. Taking the "Dormition" church as reference, the "Saint Hierarch Nicholas" church should be placed in front, not behind the former. 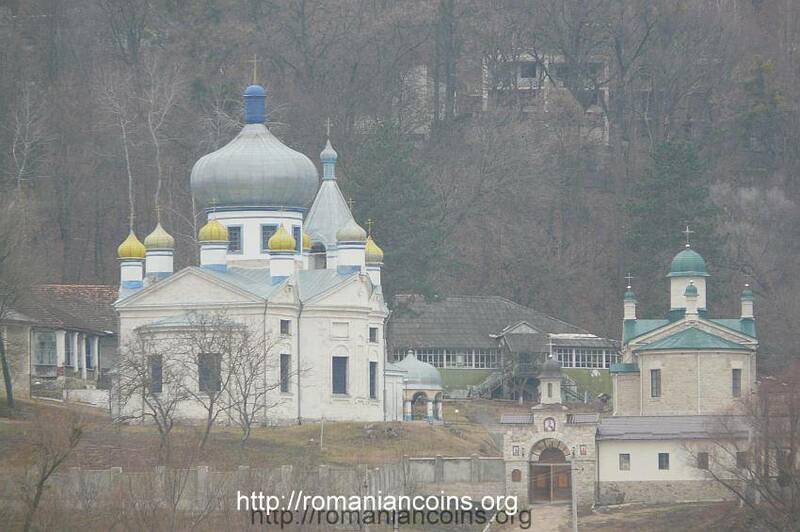 The buildings behind the "Dormition" church were replaced by conventional forest landscape. 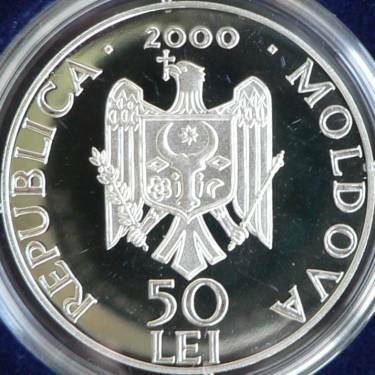 The monastery of Condriţa is placed inside the Codri (Forests) of Moldavia, at about 26 kilometers from Chişinău. 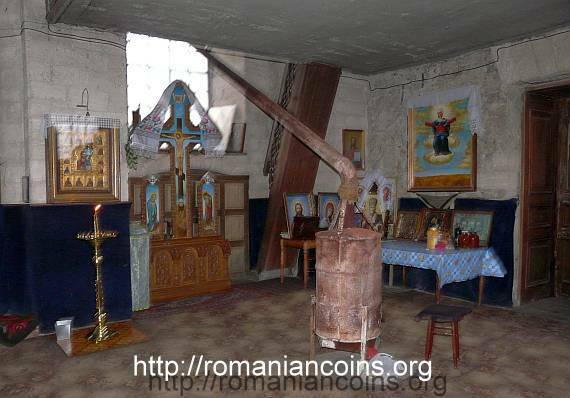 It was established in 1783 by monk Iosif, who came from the monastery of Căpriana. According to a local legend, the monastery was founded by a retired haiduc (brigand) named Condrea who wanted to atone his sins. The consecration of the older and smaller, winter church, is to the Saint Hierach Nicholas, who is also the patron of the monastery. The church of the Dormition (summer church) - was erected between 1895 and 1897, in eclectic style. 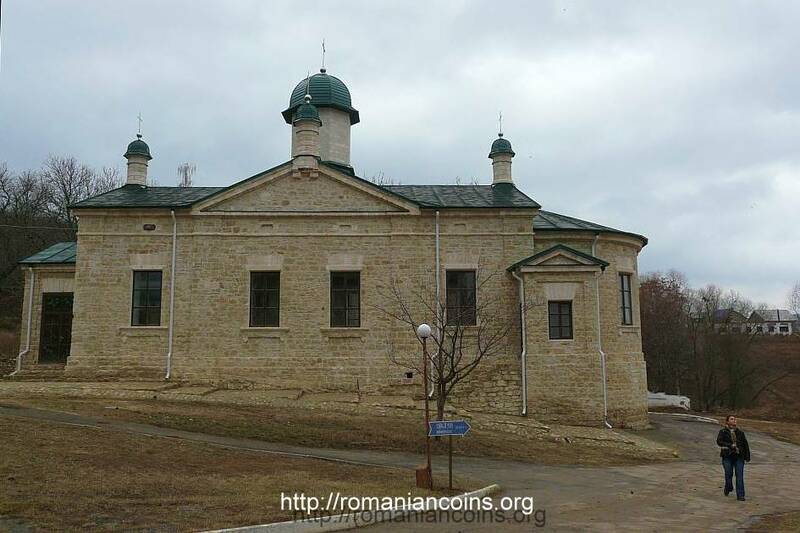 In 1918 the hermitage of Condriţa separated from Căpriana due to its increased number of indwellers, thus becoming an independent monastery, under the abbot Daniil Grozavu. Together with the Soviet invasion, the monastery was forcibly terminated by the new atheist authorities. 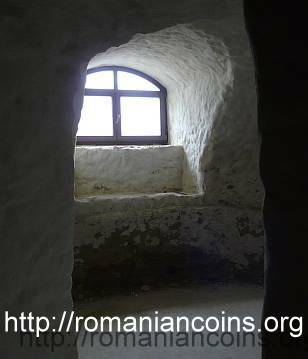 In 1947 the monks were ousted to the monasteries of Căpriana and Suruceni, that in turn were closed afterwards. Earlier in 1946 the Silviculture School had been established in the monastic complex, lasting over to the 1960. 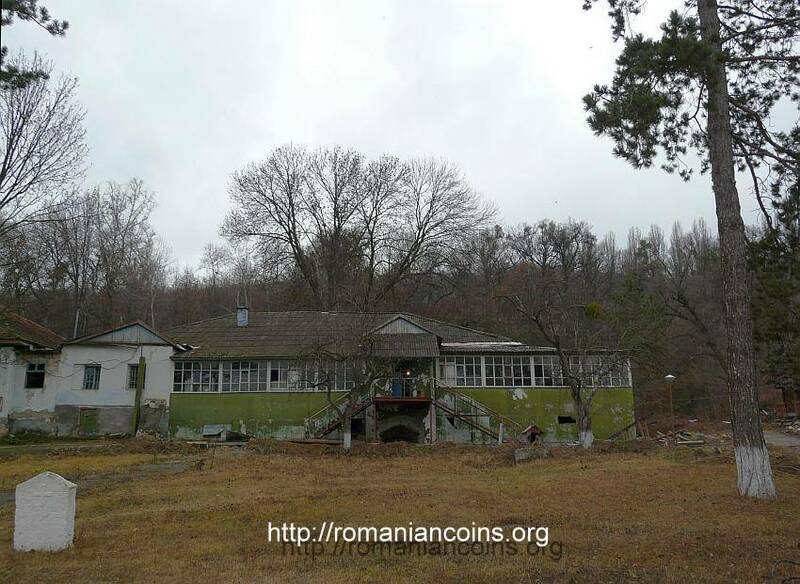 Since 1960 until 1993, the former monastic complex was the seat of the summer camp for pupils "Zoya Kosmodemyanskaya", named after a Soviet favourite hero. Everything was desecrated, but the churches themselves were not torn down. 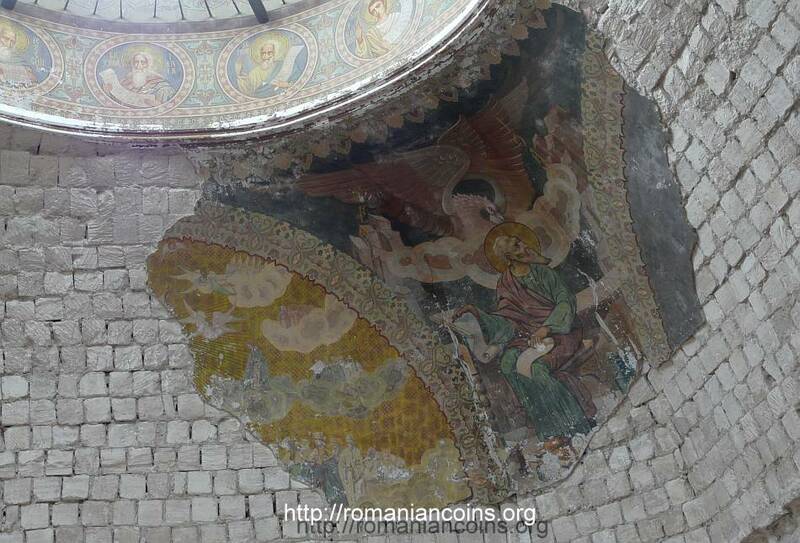 Fragments of the fresco survived only in the "Dormition" church, that was kept as depot. All the icons and other divine service inventories were thrown into the forest as garbage, out of which very few were saved and returned to the church today. 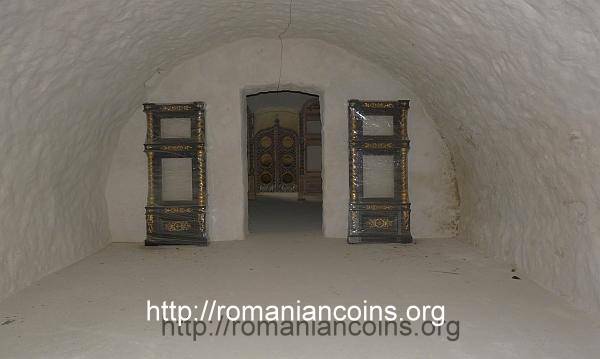 The inventory was partially completed with donations from Căpriana and Noul Neamţ monasteries. 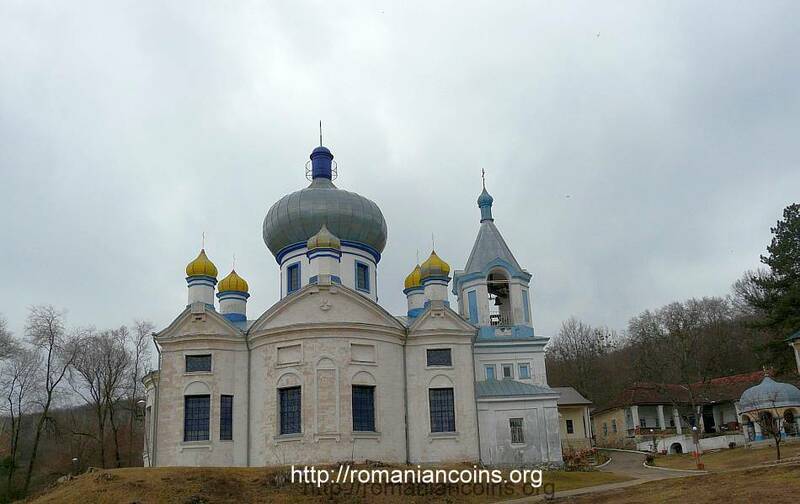 In 2012, the Dormition church is in advanced deterioration state and the whole monastery is poor. 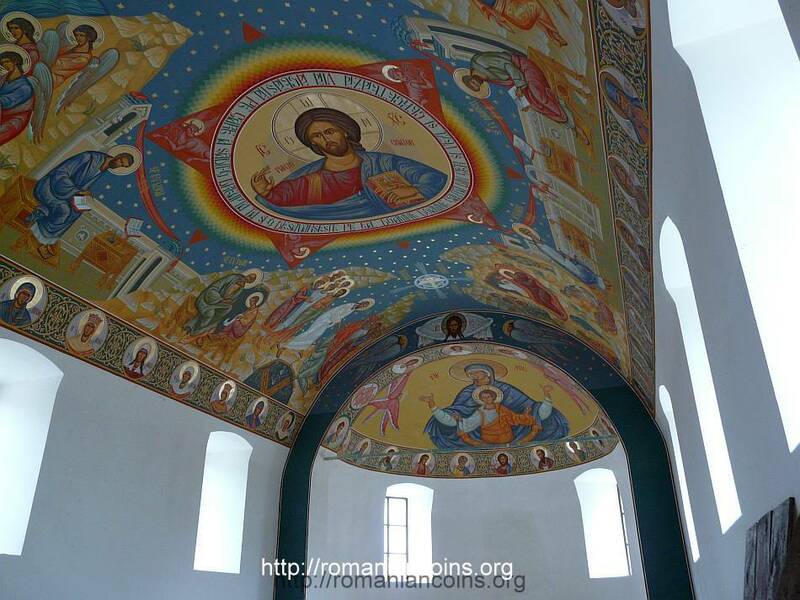 The "Saint Hierarch Nicholas" church is being restored, part of it being already repainted. 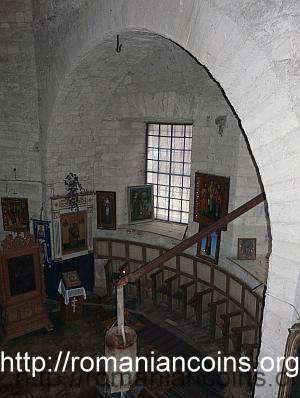 The underground level of the winter church stands for a church unto intself, also under restoration. Today it is a nun monastery, with only a few souls. Just by walking around today inside the monastery you can sense that you have travelled in time to the Bolshevik period and almost everything froze since then.